Three of our juvenile track and field athletes represented their schools in the Leinster Indoor Combined Championship held in the National Indoor Arena, Abbotstown on Thursday last. Katelyn Farrelly, junior girls (Oaklands Community College, Edenderry), Jack Saunders, junior boys (Tullamore College), and Evan Farrelly, minor boys (Oaklands Community College, Edenderry). Competing with them also was Mullingar Harriers’ Shauna Leydon, intermediate girls (Loreto Mullingar), training partner with the guys. All four athletes got off to a great start in the five event competition, with three of them producing PB’s in their first event. From there, all four kept the momentum going through to the final event. Evan – Long Jump 540cm, Hurdles 9:06 secs, 200m 25:74 secs, Shot Put 934cm and 800m, 2:41. Jack – Long Jump 507cm, Hurdles 10:18 secs, 200m 26:60 secs, Shot Put 972cm and 800m, 2:24. Best of luck to all 4 in the All Ireland Championships. Thirteen Harriers’ athletes lined up for the Geashill 5k road race on Sunday 30th September, and dominated the top positions. 1st man was Eddie Garry, 2nd man Pauric Berry and 3rd man was also a Tullamore Harrier - Jonathan Dunne. Dympna Fox was 1st lady finisher. 2nd place went to Ursula O'Reilly (Naomh Mhuire). Well done to all who competed. Full Harriers results: Eddie Garry 17:34 1st, Pauric Berry 17:49 2nd, Jonathan Dunne 18:41 3rd, Rory Farrell 18:51, Robbie Westman 18:53, Alan Heffernan 19:32, Dympna Fox 20:29 1st Lady, Ken Doyle 20:56, Brendan Carroll 22:54, Darragh Carroll 22:54, Joe Wrafter 23:20, Karen Martin 23:35, John Ward 24:05. Well done to Melissa Hogan who travelled to the Loughrea 10k on Sunday 30th September, posting 1:20 for the hilly route. 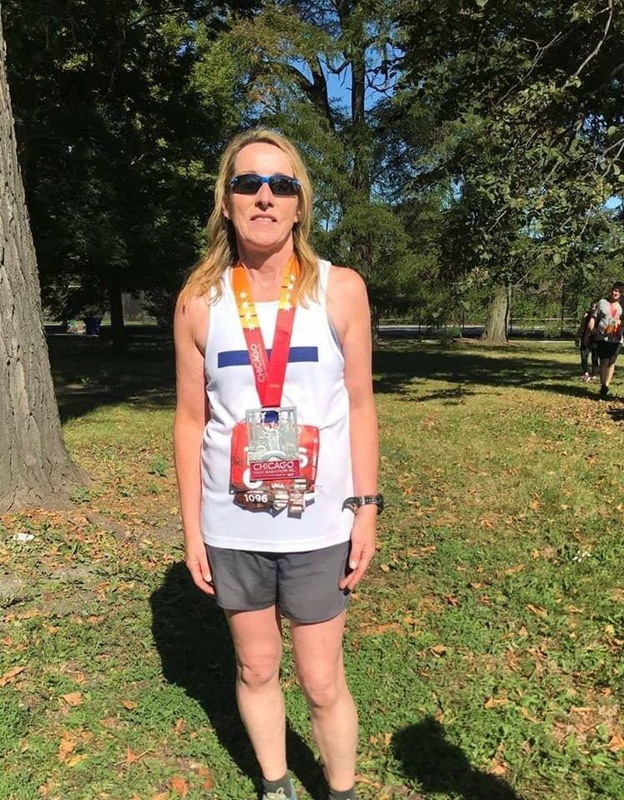 Una Mullen was one of many thousands who competed in the superb Chicago Half Marathon on Sunday 23rd September. Una who has returned following a long break due to injury, posted 1:52 for the course. Well done Una.